Lightly sugared and full of the all the fresh flavor of a summer day! 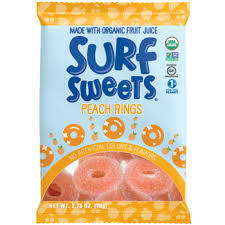 Made with organic sweeteners and organic fruit juice, our Watermelon & Peach Ring candy includes 100% DV of Vitamin C per serving and no corn syrup, artificial colors or flavors. You can feel great about your choice! PEACH added ingredients: Color Added (Organic Turmeric). To provide mindfully delicious choices for life’s sweet moments. Quality: We produce quality, great tasting ingredients and products. Choice:We are passionate about real alternatives for you and our planet. Advocacy: Our ingredients are organic, natural, and “free-from” many unsavory ingredients because we believe in a healthier, sustainable lifestyle. Pioneer: Our pioneering spirit enables us to be 1st-to-market with a range of quality, healthier sweet ingredients and candies. Passion: We care for you, our farmers and suppliers, and for our planet through Fair Trade and empowerment initiatives.